Nitro RC helicopters, also known as "Glow Powered" RC helicopters are still popular and serious contenders with electric RC helis. In fact, nitro has been experiencing somewhat of a resurgence in popularity again. Because they are tough and can take a beating, they give good power to weight ratios, they still tend to give longer flight times compared to electric, they are the lowest cost option for a fuel powered bird, and they have proven themselves time and time again. The pros and cons of nitro RC helis are explained on the Best RC Helicopter Power page. The simple fact is without the model nitro engine (also called a glow engine), it is doubtful that RC airplanes and helicopters would have taken off – literally. These little engines produce so much power for their size and weight, it's little surprise that nitro RC helicopters are still the number one choice for so many people. Seen below is one the newer nitro RC helicopters to have hit the market, the Goblin Black Nitro by SAB Heli Division. 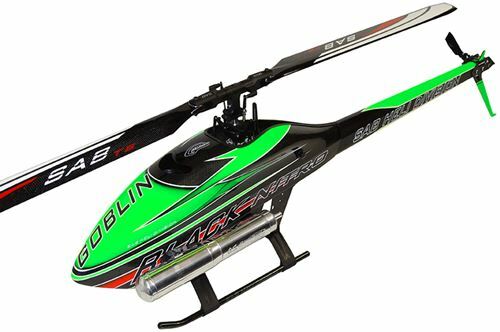 SAB only offered electric powered RC helicopters up until this model came out, so when a high-end heli manufacturer like SAB releases a nitro line, there is little doubt nitro power is far from dead and as I said, is seeing a resurgence. These include the engine itself, starting shaft, centrifugal clutch, a cooling fan and shroud, the muffler/tuned exhaust, the fuel tank, fuel tubing, an extra servo to control the carburetor, and perhaps a governor to govern engine speed (the carburetor/throttle servo is controlled by the governor). There might also be an on board glow driver if an external glow driver is not used. Nitro RC helicopters are on the bigger side of the RC heli size spectrum. There are no "micro" sized nitro powered RC helicopters in others words and most are in the 550 to 800 size range (spinning 550mm to 800mm rotor blades). As was discussed on the RC Helicopter Size page, nitro RC helicopters are generally sized not by blade length like their electric counterparts, but by engine size in displacement. Typical nitro heli sizes are 30 engine size (550 size heli), 50 engine size (600 size heli), and 90 engine size (700 size heli). One of the smallest (perhaps the smallest) and least expensive nitro collective pitch RC helicopters on the market right now, is the Global Eagle 480N shown here. With a rotor span of just 785mm (325 to 355mm blades), it's just a tad larger than a typical 450 size electric RC helicopter. The most impressive statistic on this little nitro heli is the flight time - 20 minutes plus! It uses a small 18 size nitro engine that sips fuel. If it were not so hard for me to source nitro RC fuel where I live way out in the sticks, this little bird would most definitely be on my RC heli wish list. I do admit I miss the noise and smell of nitro since converting to electric, and I can't think of neater little machine to get back into nitro with. The other interesting feature the Global Eagle 480N has, is it can be configured to electric powered as well. Let’s clear something up when it comes to nitro RC helicopters, more specifically nitro engines in general. Many people confuse or call these gas RC helicopters – this is not correct. Gas RC helicopters use 2 cycle gasoline engines, similar to the ones used in small gas powered chain saws or gas leaf blowers. Nitro engines or glow engines are completely different. They use special fuel consisting of (methanol, nitro methane, and oil) and as the name "glow" suggests, they don’t use a spark plug - a glow plug is used. Lastly, nitro/glow engines run at much higher RPM's – usually in the 13,000 – 16,000 RPM range. In order to build and fly a nitro RC helicopter, you have to be very familiar with how nitro engines work. The following items are some basic terms & items you'll need to understand when operating a glow engine. 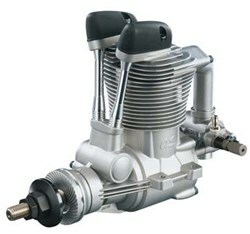 Most people will only use 2 stroke nitro engines in their helicopter because of the impressive power to weight ratio. There are still 4 stroke nitro engines out there for RC plane applications. However, a tiny number of heli examples do exist, so you should at least know a bit about them. The 4 stroke nitro engine has been around for about 40 years now. They run at lower RPM's, consume less fuel, produce less HP, but more torque at lower RPM's, and are not nearly as noisy as their 2-stroke counterparts. You can easily spot a 4-stroke nitro engine over a two stroke. They have intake and exhaust valves, which are opened and closed by rocker arms, which are moved by two pushrods. The pusrods are moved by a camshaft, which is driven off the crankshaft. All these extra components are housed externally so they are easy to spot as seen in this photo. They produce less power & noise than a two stroke for the simple reason the power stroke is occurring once every 4 cycles instead of once every two. It looked like these would become fairly popular for R/C helicopter use back in the day. Their higher torque at lower RPM's, less fuel consumption, and lower noise output a were ideal for average type flying. Not ideal however for the the higher demands of aerobatic 3D type flying which is the direction the hobby has gone to a large extent (even though not everyone flies that way). That along with the added weight, extra cost, increased complexity and maintenance has kept them very much under the radar. Now-a-days, you hardly ever see one anymore in the world of RC helicopters other than in vintage machines. OS discontinued their 4 stroke heli engine lineup a number of years back and there is no reason to think they will ever return. Their 4-stroke airplane lineup is still going strong however, and some airplane fliers wouldn't think of using anything but a 4-stroke. Now that you know a bit about nitro engines, let’s examine how they apply to nitro helicopters. But before getting into that neat stuff, here's an impressive video of a nitro powered T-Rex 700XN in action. The one thing you may notice in this video is that Alan is able to perform more aggressive maneuvers later in the flight than at the beginning. This is pretty much opposite of most electric powered flights because with electric power, the battery voltage sags slightly during the flight so there is not quite as much power near the end. Moreover, most of us don't like pushing our LiPo packs too hard near the end of a flight (bad for the battery). With nitro RC helicopters however, as the fuel is used up throughout the flight, the power to weight ratio increases. In other words, the heli gets lighter through the flight, yet is producing just as much power and you can really start tossing it around. 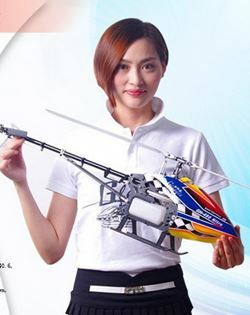 The RC helicopter relies on its engine more than any other form of RC model. RC planes can glide in for a landing, RC cars and trucks simply coast to a stop and RC boats will continue to float if their engines quit. Helicopters on the other hand depend on engine power to stay in the air. Yes there are auto rotations, but when you are learning, an engine flame out will pretty much ruin your day and lighten you wallet. This dependence on reliable power is key to understanding the unique ways nitro engine set-ups in RC helicopters differ from any other RC model. 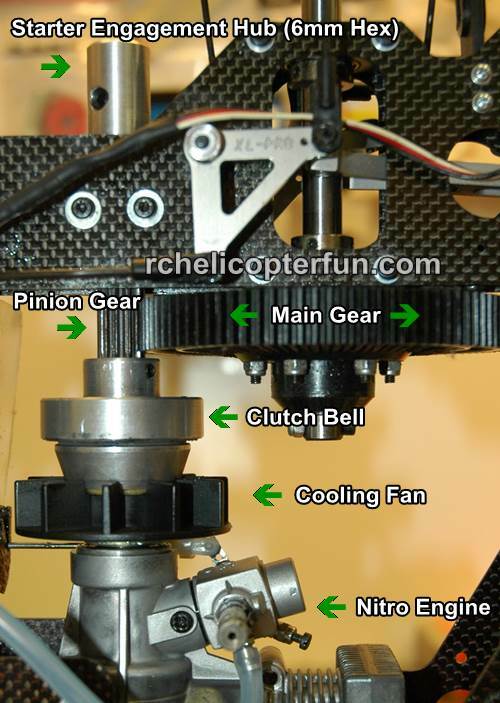 There are other challenges that nitro engines in RC helicopters face such as getting adequate cooling and the many different ways of starting the nitro engine. What about the nitro fuel tank ? Simple right... This is a huge topic on its own, getting it wrong ensures helicopter flying and engine problems. Speaking of fuel, what about all that messy oil residue. When Starting A Nitro RC Helicopter. The blades won't spool up until the engine speeds up and the centrifugal clutch engages. "How does the Clutch Work?" I get this question often enough I thought I better address it. 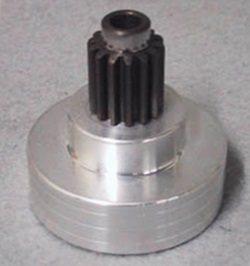 Here is typical centrifugal RC helicopter clutch with the starter shaft attached to it. The clutch is attached to the rotating face of the cooling fan which is attached to the nitro or gas engine output shaft. In other words, whenever the engine is spinning, the clutch is also spinning. 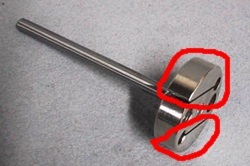 As the engine speeds up, centripetal force cause the ears of the clutch (circled in red) to spread outward. The centrifugal clutch is rotating inside the clutch bell seen here. When the ears of the clutch spread out as engine speed increases, they start rubbing on the clutch liner circling the inside of the clutch bell, and the clutch bell slowly starts rotating along with the clutch. Once up to enough speed, the ears on the clutch are spread out with such a large amount of centripetal force, the clutch and clutch bell are more or less locked together and rotating as one unit. The clutch bell has the pinion gear on the top of it and that is what in turn spins the main gear on the rotor shaft. It is therefore very important to always start a nitro RC helicopter with the throttle stick in the idle position so the engine doesn't start at a fast speed. If it starts at speed, the clutch will engage almost the instant the engine fires up, causing you some exciting moments as you go fumbling for the radio with one hand while holding the rotor head with great force to keep it from spooling up in your other hand. The photo below shows how the clutch assembly, engine, gears, and starter hub are positioned. Normally you don't see much of this from the clutch bell downward, but I have removed the cooling fan shrouding for this photo.